Guest posts is one of the biggest weapon of a Blogger to build lethal Backlinks and to increase your website traffic.All you have to do is to find a high page ranked websites and if the website allows guest post you can test your skills of Blogging and could apply for guest post but you must look and discover those websites which are related to your niche. Not much people knows this fact that Blogging is not just to write but from Blogging you can reach desirable results and you can use it to become rich.All you need to do is to follow the correct ways of Blogging,to write on the topics which are mostly needed. Its very important for a publisher to understand the true meaning of guest post if you write rationally by choosing wrong topics your post will never get passed so you must think and chose the topic wisely.Some blogs only except unique posts so creating unique posts is the key. You must only apply on those blogs which are related to your niche.Choosing random blogs will not do much so you must search for a blog which is related to your website niche that's how you can pull the traffic of that website on yours website. This is the biggest secrete to make your guest post a success.Many blogs only accept unique post so before you select any topics first search for a unique content. That's one of the most important part of the guest post inserting your website URL and inserting a brief info about you be care full not to over done it just be simple and honest,don't provide useless information be what you are. Don't try to be over aggressive be what you are don't waste any ones time try to be honest and provide quality in your posts.Making your posts bit attractive use images to explain as images speaks better then text. Try to avoid errors,improve your grammar and work on spelling mistakes.You should review your post again an again until your post become perfect.If your Guest post has many errors then its impossible that it will be published so its better to learn from your mistakes. Don't just look for the websites try to learn about it posts in this way you will be able to learn much more about the presentation of the blog on which you are applying for guest post.Make sure the topic you are working on is not published yet. 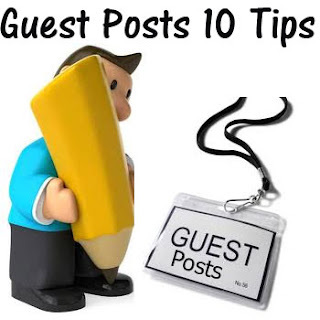 Once your guest posts gets live now its time to promote it social networking is one of the most easiest way of building traffic,leaving comments on other forums blogs and etc are the other ways of generating traffic.Remember:Not to spam don't over done it.